Getting lost and finding yourself in a Brooklyn DIY space can turn out to be the best adventure of your life. Unbounded creativity, pure joy of living, performances and art to spin your head around, in Bushwick we know that feeling very well. The spaces, a vast number of which have been left empty after manufacturing started to leave Brooklyn, have been adopted by the artists who turned them into spaces for living, making art, throwing parties, hosting classes and performances, building innovative products, and fostering creative communities. The fascination over these repurposed DIY spaces lead Williamsburg-based blogger and writer, Oriana Leckert to create a website, Brooklyn Spaces, where she aggregated, and told the story of 120+ of them over the course of several years. Now 50 most prominent of them are being featured in an eponymous book written by Oriana and published by Monacelli Press on May 19. Beautifully designed and photographed book, includes tight write ups about each of the spaces. Oriana dipped into their history and discussed highs and lows of the founders in their efforts to keep their space functional and afloat. House of Yes, Bushwick City Farm, The Spectrum, and many others of the featured spaces are located in the greater Bushwick area. Oriana truthfully and honestly captured the spirit of these often ephemeral spaces creating a time capsule of Brooklyn DIY culture of the previous years. 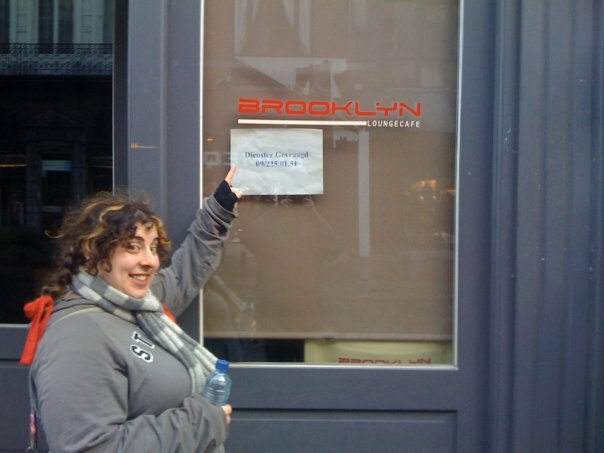 Interestingly, several of the featured spaces closed between writing and publishing of the book (RIP Body Actualized), which only reminds us how dearly important books like Brooklyn Spaces are. The spark of inspiration coming from these repurposed factories influences the entire generation of culture makers and reaches far beyond the borders of Brooklyn. We spoke with Oriana about the creation this book, trends in DIY culture and the future of her website. 1. 50 Brooklyn spaces is a lot. How long did it take your to go to and write about each of them? Thank you, yes, it is a lot! I didn’t quite realize how much work that was going to be. I had a very short timeframe to write the book—about three months—so last summer was completely insane. In 12 weeks I did about 60 interviews and probably 80 visits to spaces for photo shoots, not to mention all the research and writing. 2. Also what were your criteria to select a space for the book? Basically I tried to present a broad spectrum of the places that make Brooklyn the best place in the world right now. I included spaces from many neighborhoods; spaces new and old, private and public; spaces for music and learning and performing and making the world a better place. Each space, to me, sits at the intersection of creativity, culture, and community. 3. I know it's probably hard but from among the spaces in the book, is there perhaps one or two that have a very special place in your heart? Gowanus Ballroom. To me this is everything a “Brooklyn space” could be. The Ballroom is an incredible old historic building—it was once a cannonball factory!—re-appropriated by a motley crew of amazingly creative people into both a thriving artistic business and a community gathering place and home for wild displays of culture. House of Yes. The women behind House of Yes are some of the scrappiest entrepreneurs as well as the most sensational performers in Brooklyn. Most DIY/underground spaces get one shot at success before being felled by any number of outside or inside forces; the House of Yes is poised to open their third location, bouncing back from first a catastrophic fire and then a massive rent increase. The crew are also some of the most in-demand aerial and circus performers in town, and their homegrown shows are exceedingly high caliber, innovative, collaborative spectacles. Chicken Hut. This gigantic artist loft in a former feather-processing factory feels like one of the last seriously wild places in an increasingly hyper-gentrified Brooklyn. Since its inception in 2000, some 80 people have lived, worked, and made art together there—not to mention throwing some of the craziest, funnest parties I’ve ever been to. They’re also the twisted minds behind the annual freak-bike bacchanal Bike Kill, among many, many other bizarre and wonderful projects. 4. You're an expert on DIY spaces. Is there a greater tendency or a trend you keep seeing again and again? This is kind of a big question that I’m not quite sure how to answer. 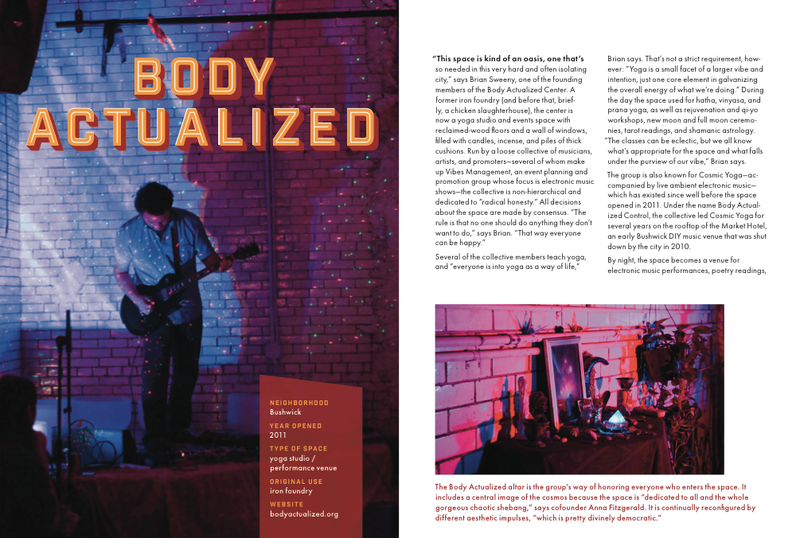 One thing I would say is that although this is a very difficult time for DIY spaces—it seems there is no end to the expensiveness of this city, and authorities are watching for infractions more closely than ever—NYC’s creative folks remain unstoppable, and there are exciting new spaces popping up all the time. Additionally, this “movement,” or whatever you might call it, has been going on long enough that spaces are getting second acts. The people behind the Muse, Silent Barn, House of Yes, and Secret Project Robot all lost their spaces, and instead of giving up, they are now pioneering new ways to do DIY better, more legally, and more beautifully. 5. Several of the spaces featured in the book have closed before the book was published. How do you feel about that? Did you even consider that possibility when selecting the spaces? Yes, that’s true. I’m very sad about it but not wholly unsurprised; these spaces are by their nature fleeting, which is why I’ve felt it to be so important to document (and enjoy!) them while they’re here. I did glancingly consider that possibility when selecting spaces, but not too much; my goal was to present a snapshot of a cultural moment, and I feel strongly that each space in the book has contributed deeply to creative life in Brooklyn today. 6. Will you keep working on your website now that you have a book? Yes! I thought I’d have time to put up new profiles while I was doing the book but that didn’t happen. Now that I’ve got my life (somewhat) back again, I will definitely get back to the site. Also, the calendar is always, always ongoing—I spend probably an absurd amount of time updating that with all the best, strangest, and loveliest events, which I also list daily on the BK Spaces Facebook & Twitter. Brooklyn Spaces launches on May 19. You may pre-order the book at Monacelli Press or on Amazon. 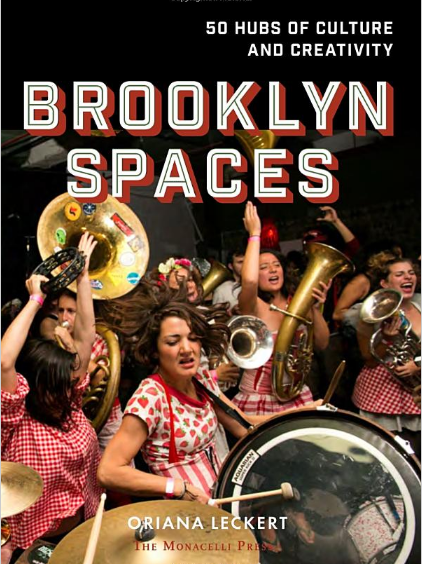 Attend Brooklyn Spaces launch party at Gowanus Ballroom, 55 9th St, Gowanus, on May 30 (Saturday), 7pm until late, featuring brass bands, aerial performances and a group show of Brooklyn Spaces photographers. Suggested donation $10.